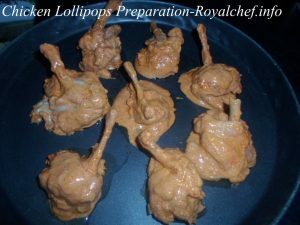 This is a simple step-by-step Recipe for making at home tasty and delicious Typical Restaurant or Dhaba Style Masaledar Chicken Lollipop. 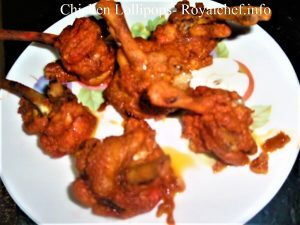 These Chicken Lollipops, which are crispy and spicy are easy to make at home, once you have all the essential ingredients in place. They can be served as starters snacks for parties or with the main course meals. Wash the Chicken pieces. Cut the Onion rings. Wash and chop the Coriander Leaves. 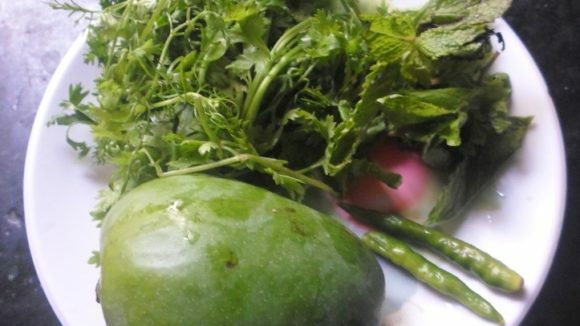 Prepare green Chutney. In a medium size bowl mix the Curd, Red Chili Powder, Garam Masala, Coriander Seeds Powder, Cumin Seeds Powder, Chat Masala, Ginger-Garlic Paste, Salt, Oil and Chicken Pieces. Then keep it aside for 30 minutes. Arrange the Chicken pieces over the nonstick plate. Preheat the Microwave and set it on 180 degrees and insert the non stick plate inside the Owen and bake for 15 minutes. Before serving arrange the Chicken pieces and garnish with Onion rings, Coriander and Green Chutney.